Matthias Servaes von Ottenheim (Kottenem, Kottenheim), an Anabaptist martyr, was born in 1536 in the district of Mayen, near Koblenz, Germany. He was a linen weaver. His wife, Aeltgen (Adelheid) van Tongeren (in the bishopric of Liege), apparently did not understand German, for in one of his letters Matthias asked for a Dutch New Testament for her. Servaes was baptized at Andernach, Germany, and lived for a time at Brohl. His simple manner won him the respect and affection of his fellow believers. He was ordained a preacher of the Anabaptists by Zelis from the Eifel, an itinerant Anabaptist preacher, who courageously cared for his brotherhood in the time of persecution. He was distinguished by his natural eloquence and noble character. Preaching and baptizing he traveled with Heinrich von Krufft, a Jülich Anabaptist, through the regions of the lower Rhine. "Heinrich Krufft and Servaes are the chief preachers who are accustomed to teach their people and baptize around Gladbach, Dülken, Süchteln and the vicinity in many villages. He could not tell where Krufft lived, for Krufft does not stay long at a place. Meetings were held between Gladbach and Viersen in a stone quarry," we read in the confession of Thies von Dülken. In 1565 Servaes was in Cologne to minister to the sorely tried church there. In the midst of severest persecution the Cologne Anabaptists had continued their meetings. But one evening their place of meeting was betrayed and all attending were captured. There were about 56 persons, Servaes among them. They were taken to the Bayen tower, where their names were recorded. When they were asked who their preacher was Martin Servaes freely acknowledged his calling. The trial was directed chiefly against him. 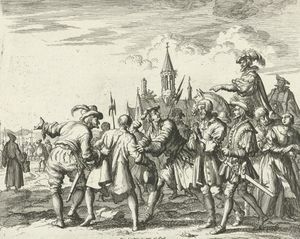 With deceit and cunning, with beseeching and threatening they beset him; to learn the names of other Anabaptist preachers they placed him on the rack; with the severest torture they sought to learn who had ordained him and to obtain information which would lead to the detection of others. But "I pressed my lips together, yielded myself to God, suffered patiently and thought of the Word of the Lord: Greater love hath no man than this, that he lay down his life for his friends," he writes in noble humility and simple heroism. During his imprisonment he engaged in several discussions with Cassander, an important Catholic scholar. His faithfulness to his convictions deeply impressed Cassander as well as others who disputed with him. Eberhard, the Bishop's chaplain, is said to have kindly commended him to the Lord, he writes in a letter. "And if we were where the duke wishes, we would be free." The judges became more lenient and kindly in feeling. "The affair would probably be all right," they observed, "if it would not finally end in revolution." Thus the quiet meetings of the Anabaptists were considered seditious and illegal. Their steadfast devotion to their faith was in the eyes of the authorities an obstinate adherence to heresy which merited death. This is expressed in an old tower chronicle of Cologne, which records of Servaes, "Anno 1565, on Saturday, the thirtieth or last day of June, Mattheis Servays of Cottenheim, preacher and baptizer, by vocation a linen weaver, Hermann von Daverkhausen, and Jost Boterknap, a tapestry weaver of Brussels, all three Anabaptists, because of their obstinacy and also because they held secret meetings at night contrary to law . . . , and because they have repeatedly administered baptism contrary to imperial mandates, further because they stubbornly persist in their heretical faith and rebaptism, will not desist from their error nor listen to pious admonitions, have been delivered from the Cunibert tower to the duke and the bailiff according to custom." A great crowd is said to have assembled at the site of the execution. The hymn written to commemorate his death described the crowd and the pity felt by some that he should die for such a deed. Servaes had pardoned his enemies, and suffered martyrdom happy for the privilege of giving his life for the glory of God. The nobility of his character was seen in the letters he wrote in prison to his family, his brethren, and the members of his church. Concerning this epistle Goebel says, "They are true pearls of Christian life and on a par with the most beautiful testimonies of Protestant martyrs. Where do we find in them, breathing as they do the peace of God, and the spirit of conciliation, any seditious, traitorous ideas that threaten temporal authority? Besides practical admonitions to his fellow elders Servaes writes a happy confession of his Biblical faith. Patiently he bears his bonds to the glory of the heavenly Father. Yea, he is willing to endure even greater suffering, not to secure his place in heaven, but to the greater honor of God. It is not fanaticism, which probably also makes superhuman endurance possible, that speaks from his open letters, but the peace of a heart that hopes soon to enter into the heavenly home." His death was sung in the hymn, "Hinweg ist mir genommen," that names Heinrich von Krufft in acrostics; it is No. 1095 f. in Wackernagel, Kirchenlied V, and No. 24 in the Ausbund. Another hymn, beginning with the words, "Mit Angst und Not ruf ich dich an," and spelling the name of Servaes in acrostics, was written by him (Wackernagel, No. 665, and Ausbund, No. 41). Van Braght's Martyrs Mirror contains 10 letters by Servaes, all written in prison and addressed as follows: one to H. K. (i.e., Heinrich Krufft); one to his brother; one to I. N.; one to the congregation of Cologne; one to his mother, his brother Johann, his brother-in-law Leonhard, and his two sisters; one to his wife, who was also in prison; one to I. N. and his brethren; one to his wife Aeltgen; one to F. V. H.; and one to Maria West. Braght, Thieleman J. van. Het Bloedigh Tooneel of Martelaers Spiegel der Doops-gesinde of Weereloose Christenen, Die om 't getuygenis van Jesus haren Salighmaker geleden hebben ende gedood zijn van Christi tijd of tot desen tijd toe. Den Tweeden Druk. Amsterdam: Hieronymus Sweerts, 1685: Part II, 327-43. Braght, Thieleman J. van. The Bloody Theatre or Martyrs' Mirror of the Defenseless Christians Who Baptized Only upon Confession of Faith and Who Suffered and Died for the Testimony of Jesus Their Saviour . . . to the Year A.D. 1660. Scottdale, PA: Herald Press, 1951: 688-703. Available online at: http://www.homecomers.org/mirror/index.htm. Cramer, Samuel and Fredrik Pijper. Bibliotheca Reformatoria Neerlandica, 10 vols. The Hague: M. Nijhoff, 1903-1914: v. VII, see Index. Crous, E. "The Mennonites in Germany Since the Thirty Years' War." Mennonite Quarterly Review 25 (October 1951): 237. Ennen, Leonhard. Geschichte der Stadt Koln IV. Cologne and Neuss, 1875: 816-20. Goebel, M. Geschichte des christlichen Lebens in der rheinisch - westphälisch - evangelischen Kirche I. Coblenz, 1849: 217. Hege, Christian and Christian Neff. Mennonitisches Lexikon, 4 vols. Frankfurt & Weierhof: Hege; Karlsruhe: Schneider, 1913-1967: v. I, 338 f.
Der Mennonit 9, No. 1 (January 1956): 11. Wackernagel, Philipp. Das deutsche Kirchenlied von der ältesten Zeit bis zu Anfang des XVII. Jahrhunderts, 5 vols. Leipzig, 1864-1877. Reprinted Hildesheim : G. Olms, 1964. Hege, Otto. "Matthias Servaes von Ottenheim (1536-1565)." Global Anabaptist Mennonite Encyclopedia Online. 1957. Web. 20 Apr 2019. http://gameo.org/index.php?title=Matthias_Servaes_von_Ottenheim_(1536-1565)&oldid=145114. Hege, Otto. (1957). Matthias Servaes von Ottenheim (1536-1565). Global Anabaptist Mennonite Encyclopedia Online. Retrieved 20 April 2019, from http://gameo.org/index.php?title=Matthias_Servaes_von_Ottenheim_(1536-1565)&oldid=145114. Adapted by permission of Herald Press, Harrisonburg, Virginia, from Mennonite Encyclopedia, Vol. 3, pp. 540-541. All rights reserved. This page was last modified on 16 January 2017, at 00:06.